Robert T. Matsui served in the House from 1979 to 2005, but his earliest memories were of an internment camp where his family was separated and where they lived like prisoners, denied their most basic constitutional rights. That experience was formative for Matsui. “Adversity made [Matsui] stronger, and along the way he helped countless others to find strength as well,” noted an observer who reflected on Matsui’s long political career.1 A social liberal with a pro-market approach to trade, Matsui’s workhorse style of legislating earned the respect of his colleagues on both sides of the aisle during his 26 years in the House. Robert Takeo (Bob) Matsui was born on September 17, 1941, in Sacramento, California, to Yasuji and Alice Matsui, less than three months before Japan’s surprise attack on Pearl Harbor.2 Both his parents were born in Sacramento. Following the U.S. declaration of war against Japan, six-month-old Robert Matsui and his family were evacuated from their hometown to an internment camp in April 1942 as part of the relocation of Japanese Americans from the Pacific Coast.3 Becoming family number 25261, the Matsui family initially was sent to the Tule Lake camp in Newell, California—a remote location in the extreme northeast corner of the state. Alice and Robert Matsui were moved to a camp in Caldwell, Idaho, while Yasuji was separated from his family and sent to a Weiser, Idaho, work camp. Alice Matsui gave birth to Robert’s sister, Barbara, at the Caldwell facility.4 Eventually, the Matsui family reunited and returned to Sacramento following their release three years later. Like most internees whose livelihoods were shattered, the Matsui’s lost their family produce business in Sacramento during internment. After the war, they had to rebuild their lives. Robert attended William Land Elementary School, California Junior High, and later graduated from C. K. McClatchy High School in Sacramento, California, in 1959. In 1963 he graduated from the University of California, Berkeley, with a degree in political science. At Berkeley, he met Doris Okada, another wartime internee who was born at an internment camp in Poston, Arizona.5 In 1966 Matsui received his JD from the University of California, Hastings College of the Law, in San Francisco and practiced as a lawyer in Sacramento. Robert and Doris married in 1968 and had one son, Brian. As a young man studying at Berkeley in 1961, Matsui was motivated by the words of President John F. Kennedy’s inaugural address to enter into public service. Matsui felt inspired to “look beyond ourselves, and look to our community, our state, and our nation to see how we can improve the lot of every American.”6 At the age of 29, Matsui, a lawyer in a private practice, was encouraged to run for the Sacramento city council in 1971.7 Reflecting on this first election, Matsui said, “For historical purposes, I think it’s good to say people were coming to me, asking me to run, but the reality is that that’s not the way these things happen. You have to want it.”8 This election marked the first time the city council was divided into districts. Matsui ran a grassroots campaign and won, earning the distinction as the first Japanese American to hold this position.9 He served until 1978, and his time on the council included a year as vice mayor of Sacramento in 1977. Matsui also worked as the campaign manager for U.S. Representative John Moss’s 1972, 1974, and 1976 reelection contests.10 After 13 terms in the House, Moss announced his retirement at the end of the 95th Congress (1977–1979) and suggested that Matsui run for the open seat.11 He seemed a natural fit. Like Moss, he was a liberal with a pro-business approach.12 Matsui won a tight, fiveway Democratic primary for the urban district, which encompassed the California state capital. In the general election for the 96th Congress (1979–1981), Republican Sandy Smoley ran a competitive race against Matsui in the largely Democratic district. Speaker of the House Thomas P. (Tip) O’Neill of Massachusetts and President Jimmy Carter both stumped for Matsui, who struggled with name recognition in the campaign.13 Ultimately, Matsui prevailed by a margin of 13,000 votes, winning 53 percent of the total.14 “I think there [are] only a few times in a person’s life that they have an opportunity to do something very important and this is my opportunity,” he told a reporter after the election. “It might be frustrating, at the same time I can do it.”15 He won each of the next 12 general election campaigns by wide margins, and despite weighing a U.S. Senate run in 1990, remained in the House for the duration of his political career. As a House freshman, Matsui initially was assigned to the Government Operations and Judiciary Committees. One year later, he left Judiciary and won a seat on the influential Interstate and Commerce Committee (later named Energy and Commerce), an assignment previously held by his predecessor John Moss.16 As a sophomore in the 97th Congress (1981–1983), Matsui left his other committee assignments for a post on the exclusive Ways and Means Committee and a spot on the Select Committee on Narcotics. In the 100th Congress (1987–1989), Matsui left Narcotics, and in the 102nd Congress (1991–1993), he joined the Budget Committee. It was with the assistance of the California delegation and House leadership that Matsui received the coveted Ways and Means seat.17 When he became the first Asian-American Member to serve on that panel, Dan Rostenkowski of Illinois, the committee’s autocratic chairman, commented that Matsui was philosophically “a pretty good package.”18 In 1993 Matsui became interim chair of the Ways and Means Subcommittee on Human Resources, succeeding Harold Ford Sr. of Tennessee.19 A year later, Matsui was tapped again to serve as an interim chair, this time on the Ways and Means Subcommittee on Trade when Sam Gibbons of Florida moved up to chair the full committee. “The trade subcommittee has a number of important issues to address this year, and it will take a concerted effort by our members to meet the challenges ahead of us,” Matsui said. “I have the utmost confidence in our committee’s ability to meet those challenges.”20 Matsui later left the Subcommittee on Trade and moved to the Subcommittee on Social Security. Matsui’s pragmatic approach to the idea that open trade would promote human rights allowed him to focus on the benefits while rounding up the necessary votes. The effort underscored his reputation as a legislative workhorse. “I enjoy trying to work through a strategy on how you get 218 votes,” he said.41 Matsui saw the open market with China as imperative. “I’ve always believed that technology and trade were the two engines that really drive economic growth,” he observed. “If we want to continue to be the number one nation in the world when it comes to job creation, when it comes to leading the cutting edge, we have to understand that these things are important.”42 The trade relations bill passed the House 237 to 197 and was signed into law on October 10, 2000. But, following the 2004 election cycle, Matsui’s health deteriorated. After a brief battle with pneumonia, complicated by a rare blood disease, the 63-year-old Congressman died on January 1, 2005, in Bethesda, Maryland, surrounded by his family. A private person, Matsui had not publicly disclosed his illness, so his sudden passing came as a shock to the congressional community, which held a special memorial service in the U.S. Capitol’s Statuary Hall. 1Deb Kollars and Will Evans, “Hundreds Say Last Goodbye to Congressman; Touching Tributes Flow As Colleagues, Family, Friends and Others Praise the Sacramento Native,” 9 January 2005, Sacramento Bee: n.p. 2Betty Cuniberti, “Internment: Personal Voices, Powerful Choices,” 4 October 1987, Los Angeles Times: n.p. 3William Eaton, “Internee Payment Bill Gets Final OK,” 5 August 1988, Los Angeles Times: 1. 6Robert T. Matsui, interview by Brian Lamb, American Profile Series, C-SPAN, 4 October 1988, http://www.c-span.org/video/?4551-1/ life-career-robert-matsui&start=1145 (accessed 13 January 2017). 7“Matsui, Robert T.,” Current Biography Yearbook 1994 (New York: H.W. Wilson Company, 1994): 368. 9Sam Stanton and Steve Gibson, “Council Win Was First of Many,” 3 January 2005, Sacramento Bee: A10. 10Politics in America, 1990 (Washington, DC: Congressional Quarterly Inc., 1989): 102–103. 12Almanac of American Politics, 1976 (Washington, DC: National Journal Inc., 1975): 56–58. 13Martin Nolan, “O’Neill Lends Celebrity Status to Congressional Candidates,” 21 October 1978, Boston Globe: 24; W. Dale Nelson, no title, 5 November 1978, Associated Press. 15“Mr. Matsui Goes to Washington,” archived video, 4:14, from NBC Nightly News on 4 February 1978, accessed 4 April 2016, http://digital.lib.csus.edu/cdm/ref/collection/mats/id/195. 16Garrison Nelson, Committees in the U.S. Congress, 1947–1992, vol. 2 (Washington, DC: Congressional Quarterly Press, 1994): 642–643. 17Richard Lyons, “On Capitol Hill,” 25 January 1979, Washington Post: A2; Martin Tolchin, “Congress Plays Party Games by Committee,” 25 January 1981, New York Times: E5. 19Hearing before the House Committee on Ways and Means, Subcommittee on Human Resources, Selected Aspects of Welfare Reform, 103rd Cong., 1st sess., (30 March 1993); “Harold E. Ford, Sr.,” Biographical Directory of the U.S. Congress, 1774–Present, http://bioguide.congress.gov/scripts/biodisplay.pl?index=F000261. 20Gerard Lim, “Matsui Named Chair of Trade Subcommittee,” 17 June 1994, AsianWeek: 3. 21Tax Reform Act of 1986, H.R. 3838, 99th Cong. (1986); “House Approves Major Rewrite of Tax Code,” CQ Almanac, 1985, 41st ed. (Washington, DC : Congressional Quarterly Inc., 1986): 480–498; Steven W. Stathis, Landmark Legislation, 1774–2002: Major U.S. Acts and Treaties (Washington, DC: Congressional Quarterly Press, 2003): 325. 22Congressional Record, Extension of Remarks, 99th Cong., 1st sess. (16 December 1985): E5638. 23Julie Ha, “Congressman Matsui Criticizes Proposed Medicare Cuts: GOP Plan an Assault on the Elderly,” 31 October 1995, Examiner: 9. 24Hearings before the House Committee on Ways and Means, Subcommittee on Human Resources, Welfare Reform Proposals, Including H.R. 4605, the Work and Responsibility Act of 1994, Part 1, 103rd Cong., 2nd sess. (26–28 July 1994): 342. 25Robert Matsui, “What Can Congress Do To Stabilize the Future of Social Security?” 6 December 2004, Roll Call: n.p. 26Hearings before the House Committee on the Judiciary, Subcommittee on Administrative Law and Governmental Relations, Japanese-American and Aleutian Wartime Relocation, 98th Cong., 2nd sess., (20–21, 27 June 1984 and 12 September 1984): 24. 27Japanese-American and Aleutian Wartime Relocation: 24. 28Civil Liberties Act of 1987, H.R. 442, 100th Cong. (1987). 29Congressional Record, House, 100th Cong., 1st sess. (17 September 1987): 24304. 31Public Law 100-383, 102 Stat. 903 (1988). 32“Congress OKs North American Trade Pact,” CQ Almanac, 1993, 49th ed. (Washington, DC: Congressional Quarterly Inc., 1994): 172–176. 33Kevin Merida, “The Whip Lashes Out,” 10 November 1993, Washington Post: C1. 34Politics in America, 1998 (Washington, DC: Congressional Quarterly Inc., 1997): 100. House Republicans worked separately with their own NAFTA whip group. See “Congress OKs North American Trade Pact”: 178. 35Congressional Record, House, 103rd Cong., 1st sess. (17 November 1993): H29945. 36“Congress OKs North American Trade Pact”: 178. 37North American Free Trade Agreement (NAFTA) Implementation Act, H.R. 3450, 103rd Cong. (1993). 38Politics in America, 2004 (Washington, DC: Congressional Quarterly Inc., 2003): 77; H.R. 4444, 106th Cong. (2000). 39Ann Scott Tyson, “The Fine Art of Twisting Arms for China Trade,” 19 May 2000, Christian Science Monitor: 1. 40Congressional Record, House, 106th Congress, 2nd sess. (24 May 2000): H3671. 41Matthew Vitta, “On Hill, Clinton Turns to Calif. Free-Trader; Matsui Has Key Role on China Legislation,” 5 April 2000, Washington Post: A17. 43Paul Houston, “Matsui Named to Top Fund-Raising Post Politics: He and Rockefeller Will Head Democrats’ Contribution Drive For 1992 Elections,” 5 September 1991, Los Angeles Times: 20; Michael Doyle, “Matsui Takes Top Fund-Raising Role,” 24 December 2002, Sacramento Bee: A1. 46Memorial Address and Other Tributes Held in the House of Representatives and the Senate of the United States Together With the Memorial Services in Honor of Robert T. Matsui, 109th Cong., 1st sess. (Washington, DC: Government Printing Office, 2006): 14. 47Norman Ornstein, “Bob Matsui: Wonk, Fighter, and All-Around Great Guy,” 26 January 2005, Roll Call: n.p. 48Kevin Yamamura and David Whitney, “Matsui’s Widow Launches Campaign for Congress,” 13 January 2005, Sacramento Bee: A3. Electronic records: Amount unknown. The Honorable Robert T. Matsui Legacy Project website contains digital reproductions of select photographs, documents, video and audio clips from public sources and the Matsui family. The focal point of the website is on Robert T. Matsui and his leadership in Congress working to secure redress and reparations for Japanese Americans following the incarceration and exclusion of Japanese Americans from the West Coast of the United States during World War II. The website is accessible at the following web link: http://digital.lib.csus.edu/matsui/. Papers: ca. 1940-2006, 306.25 linear feet. 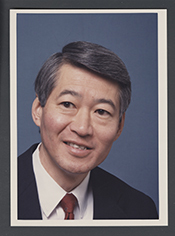 The Robert T. Matsui papers consist primarily of files Matsui compiled during his career as a politician. The bulk of the collection is comprised of materials documenting Matsui's work in the United States House of Representatives as Congressman for California's Sacramento district, especially pertaining to his lengthy service on the Ways and Means Committee; also prominent in the collection are Matsui's office and press files, personal correspondence, campaign and political files and a limited amount of Sacramento City Council materials. The collection encompasses a range of materials--including correspondence, legislative addresses, campaign literature, press releases, schedules, and ephemera--most notably documenting such legislation and issues as: health care, social security, tax, and welfare reform; the North American Free Trade Agreement and approval of the Uruguay Round Agreements; civil rights and Japanese American internment redress; Sacramento regional water and flood control; and district military base closures. The collection is restricted until January 1, 2020 or the death of Doris Matsui, whichever is later; researchers may apply for access to the collection. Inquiries regarding these materials should be directed, in writing, to the Head of Public Services, The Bancroft Library. The finding aid is available online: http://oac.cdlib.org/findaid/ark:/13030/kt7d5nf4pj/?query=matsui. Papers: In the Sierra Club National Legislative Office Records, ca. 1960-1990, 200 linear feet. Persons represented include Robert Matsui. Papers: In the John Stanton Political Campaign Collection, 1860-2007, amount unknown. Persons represented include Robert Matsui. Videocassette: 1988, 2 commercials on 1 videocassette. The commercials used during Robert Matsui's campaign for the 1988 U.S. congressional election in District 3 of California, Democratic Party. "Robert T. Matsui" in Asian and Pacific Islander Americans in Congress, 1900-2017. Prepared under the direction of the Committee on House Administration by the Office of the Historian and the Office of the Clerk, U.S. House of Representatives. Washington: Government Publishing Office, 2018.